Tracking lions in the wilderness of Meru National Park can be nerve-racking, tear-jerking, horrifying, heart-warming and tiring. However, one thing is for sure, monitoring lions is not boring. One of my favourite prides in Meru is Mulika. The original pride comprised 13 members, including cubs, but has since split up into several prides. 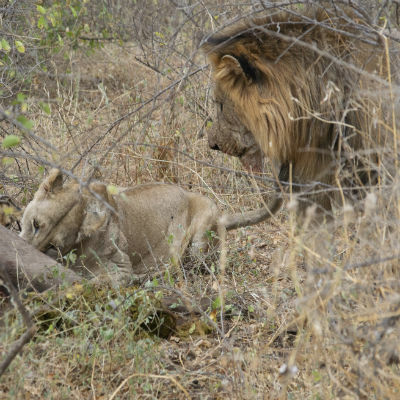 Late last year, the pride’s dominant lion, Simon, was viciously ousted through a coalition of two younger males. Since then, one of these two males mated with one of the females and now have two cubs, aged about five-months-old. So the fight was not in vain! Our Born Free Meru team has spotted this splinter pride of four hunting on several occasions during regular lion monitoring sessions. The other male collaborator has not been sighted since the coup against Simon and is likely to be roaming the vast park. One afternoon I received a call from a tour guide friend saying he had just spotted two cubs in the park. After getting the location of the cubs, I sped off to the site. As I drove on a near impassable road that has been swept away by the last heavy rains along Mulika River, I peered through the bush trying to locate the cubs. In no time at all, I found them playing on the river bank, but no sight of any other lions. I knew the mother couldn’t be far away and was keeping a watchful eye on her young ones. As I watched them play for half an hour, I kept peering to see where their mother was hiding. A few metres away under scrub bush, there she lay resting and keeping both eyes on her energetic cubs. After spending more than an hour observing and taking their details, I felt it was time to leave the site. Little did I know there was a lot more to come! Soon after starting the vehicle, an adult female waterbuck sauntered near the lions towards the river along a small path. I immediately switched off the engine to see what would unfold. The waterbuck marched majestically to the river, eager to quench her thirst, not knowing it was her last day in this world. Suddenly, a male lion sprang out of the bush and within a fraction of a second, dust rose and the baying sounds of the dying waterbuck filled the air. In no time, the lion was having his hot meal. After having his fill, he allowed the female and cubs to move in for their feast before he went off to sleep under a tree shade a few metres away. Even for our team that regularly tracks these lions, witnessing such a kill at close range is a rare and unforgettable experience!